Ser-en-dip-i-ty: noun. The occurrence and development of events by chance in a happy or beneficial way. Last night while doing some random internet searching for the Carpenter family, I entered the name “James Buchanan Carpenter” into the search bar at ancestry.com. James B. Carpenter is Don’s maternal great-grandfather (Leona’s grandfather) and he lived with Leona’s family when she was a little girl. Using the site as a non-paying guest, I knew that if any possible matches came up I could go to the public library and look at the records. Only the index of records is available to non-subscribers, but it’s a good place to start. You can imagine my surprise when the first hit was a tiny thumbnail picture labeled “James and Mary Carpenter and family” – WHAT? Somebody else knows these people? And has pictures of them? I could see a young boy in the front of the picture and was quite certain that it was Ream Carpenter, Leona’s father and Don’s grandfather. 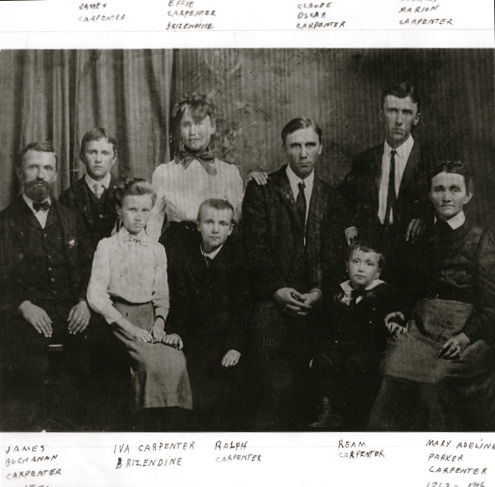 As I’ve been assembling the Carpenter genealogy binders, I’ve realized that we have almost no pictures of the Carpenter family; if any ever existed, they have been lost or destroyed over the years. And although I get excited about a census or a birth record bearing an ancestor’s name, a photograph truly adds reality to a family history. I let out a squeal of excitement, and I felt a little like the featured celebrities on “Who Do You Think You Are?” who always find cool things in their research. However, my delight quickly turned into a groan of dismay when I realized that the picture was only available to members. I didn’t want to wait until the library opened Thursday morning, and I wasn’t even sure that the library edition of ancestry would allow me access to family pictures that someone else had posted. Well, it didn’t take me long to decide that I was changing my status from guest to subscriber, and I whipped out my credit card and established a user name and password right then! 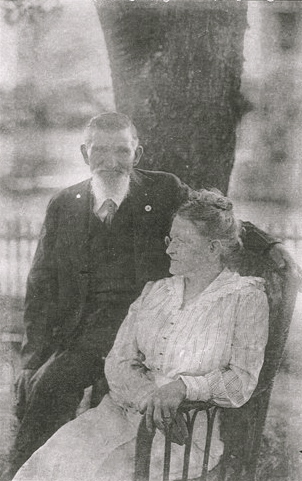 Some further clicking around (I have a lot to learn about using ancestry) produced this additional picture of James & Mary Carpenter. She died in 1916, and Leona had never seen a picture of this grandmother. We were thrilled! A huge thanks goes to a kind soul – who is most likely a distant relative – for sharing pictures. And a huge thanks to ancestry.com for providing the vehicle for this connection. They haven’t paid me a thing for writing this, and I’ll have to continue to pay my subscription, but these two pictures are well worth the money spent! Watch for further posts over here as I continue this journey.